Also called a cotton cutworm, this caterpillar is a very destrutive pest of many crops, including asparagus, bean, beet, crucifers, cucurbits, tomato, alfalfa, small fruit, peach, wheat and more. There are also many weeds that host this pest, such as dock, horseweed, lambsquarters, plantain, and pigweed. They are also becoming a bigger problem for tomatoes. 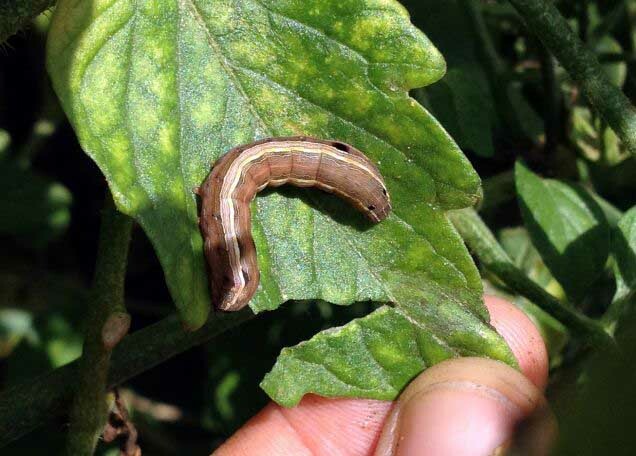 This photo was taken of the armyworm on a tomato plant in early July. This species looks very similar to the fall armyworm, but it will appear in your garden in late spring and early summer. The adults are light brown moths. These caterpillers can often be hard to find, as they do their feeding and damage at night. They will destroy young seedlings or sever the stems of plants just below the soil level. This causes the entire plant to wilt and collapse. When you remove inflicted plants, be sure to cultivate the soil 6″-8″ deep to expose any larvae in the soil. These caterpillars, as well as fall armyworms, have developed strong resistance to many common pesticides.